SharePoint 2013 introduces the new App Model that adds another dimension to the kinds of solutions you can build on the SharePoint technology platform in addition to Full Trust Solutions and Sandboxed solutions. Lets take a deep dive on the App Model and understand the fundamental building blocks. Apps for SharePoint mimics Facebook Apps to an extent. III. SharePoint 2013 Application Architecture: The diagram below talks about the SP 2013 Application Architecture and its components. 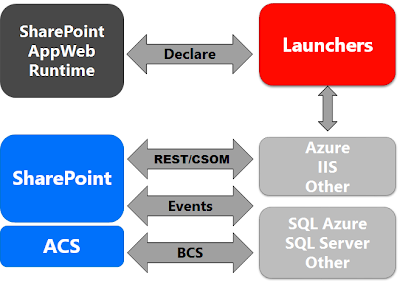 REST / CSOM - are the programmatic approaches available to access SP 2013 data from Apps. Remote Event Receivers - To handle events in an app for SharePoint remotely, you create remote event receivers and app event receivers. BCS - Apps can perform CRUD operations on external data store using ODATA by leveraging External Content Types and External Lists. V. SharePoint 2013 Application Comparison Chart: Lets see what programming options we have while creating Apps for SharePoint. VI. Different kinds of Apps for SharePoint 2013: Here are 3 different kinds architecture approaches available for creating SharePoint 2013 Apps. Managed CSOM (Client Side Object Model) can be adopted as a programming model for both these kinds of Apps. Provider-Hosted Apps- Apps developed/maintained on Premises or a Private Cloud. Auto-Hosted Apps - Apps provisioned using Windows Azure Auto-Hosting. SharePoint deploys ASP.NET application & SQL Azure DB to Azure automatically when SharePoint app is installed. i. Web scope - By default all SharePoint 2013 SharePoint apps are scoped to Web. ii. Tenant scope - Cloud based apps can have their Apps as tenant scoped. For e.g. : Apps hosted on Office 365 can have a Tenant scope for privacy and security. Not Applicable to SharePoint Hosted Apps. Great Post Mehul... excellent piece of work under one Article. I love the way you present your articles with the model diagrams. This is all a person needs to see when implementing something new Apps in SharePoint 2013.